Field preparation is needed prior to each game. The Skiles Test Facilities and Grounds Crew will make sure the fields are ready for play. The coaches for the competing teams need to finalize the fields for the game, which includes setting the pitching distance and chalking the batter's box, infield foul lines, and pitching circle (Frost Field only). We appreciate everyone's assistance in maintaining our fields and helping to keep them in the best conditions for our athletes. Prior to marking a field, the infield surface should be dragged. A tooth drag breaks up the hard surface and below to create a softer field. A mat drag smooths and spreads the surface to create a soft and level playing surface. Machine field dragging is only performed by the Facilities and Grounds team. Manual field drags are located at the fields at LECC; fields should be drug prior to games by the persons preparing the field. Rakes are used to loosen the playing surface and to level and smooth out areas of the field. The areas around the bases should have soft and loose ground more allowing players to hit the ground and slide into the bases. Material moves around in the batters box and rakes bring back the loose material and fill in gaps created by the batters. The infield should be raked each day after the last practice or game to even out the infield to prepare for the next day. Our baseball and softball field surfaces are made up of different materials. The league invested in the surface of each field this year. As we get aggressive on our game schedule, our grounds team will apply material to the surfaces to handle the weather we are dealt. We appreciate everyone coming out early and assisting prepare the fields, but ** NEVER APPLY MATERIAL TO ANY OF THE FIELDS UNLESS YOU HAVE BEEN INSTRUCTED TO DO SO **. Part of the resurfacing effort of Frost Field this season was to remove the incorrect material that had made it into the field in the past. We have field drying material for the baseball dirt mix that should not be applied to the softball fields - this material does not work in the softball mix and can create a unsafe surface as it can float on top of the surface and create a slippery mess. The fields are setup this year for improve drainage and only approved grounds personnel should be making decisions on how to treat the fields. FIELD DRY is only intended for baseball - grass infield diamonds with a baseball mix dirt surface. 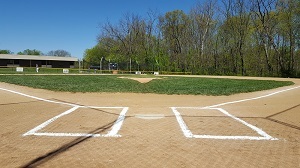 The use of FIELD DRY on a skinned softball diamond (including Frost Field where A League Baseball plays) with a limestone surface is not acceptable. Appling the wrong material to a field can incur siginficant financial costs to repair the damage. Prior to the 2017 season, the league invested in the surfaces of all the fields, predominatley an entire new surface for Frost Field which had absorbed several batches of the incorrect materal which made the previous surface unrepairable. The incorrect FIELD DRY material that had been applied to the softball field in attempt to dry the field did not blend with the limestone surface and as a result the material saturated with water and caused the field to not drain and dry as intendend. Two of our fields are setup for variable base locations. Both base locations have metal recessed base posts so the bases site securely in place. Bases should be set prior to the game. Pitching distances are measured from the back tip of home plate to the front of the pitching plate. Softball fields can host both AAA and Major Leage Softball contests but the pitching plate needs to move depending on the division playing the game. The field box located at each field contains a set of ropes precut to the specified pitching distances for the field. Select the correct rope for the division of the upcoming game and pull the rope from the tip of the back of home plate. 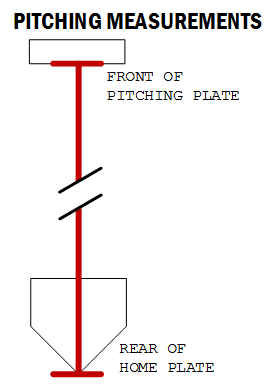 The front of the pitching plate should be placed at the end of the rope. Both baseball diamonds have removable mounds, that can either be adjusted for pitching distance or removed for coach-pitch division games. Bobby Gray Field is configured for both 60' and 70' basepaths so it can host games for both the Minor and Major League divisions. The pitcher's mound must be relocated between contests of each division to the appropriate distance. 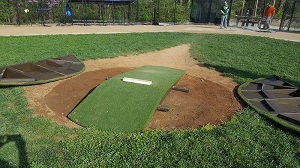 To install the mound, set the center section near its expected location. Align the pitching plate so that it is centered and perpendicular to an imaginary line between the rear of home plate and the center of second base. Measure the distance from the rear point of home plate to the front of the pitching rubber and set at the intended distance while maintaining the location on the center line. Install the outer ramps over the extended footers. To remove the mound, first remove the outer ramps followed by the center section. 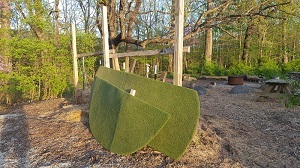 Place all the three sections of the mound upright against a sturdy support, but place the middle section between the two outer ramps for stability. Chalk is used to mark the regulation field within the infield surface. 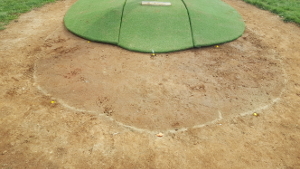 After the field is dragged and raked, the bases and pitching plate should be set to the appropriate distance. Afterwards, the chalk lines should be applied. 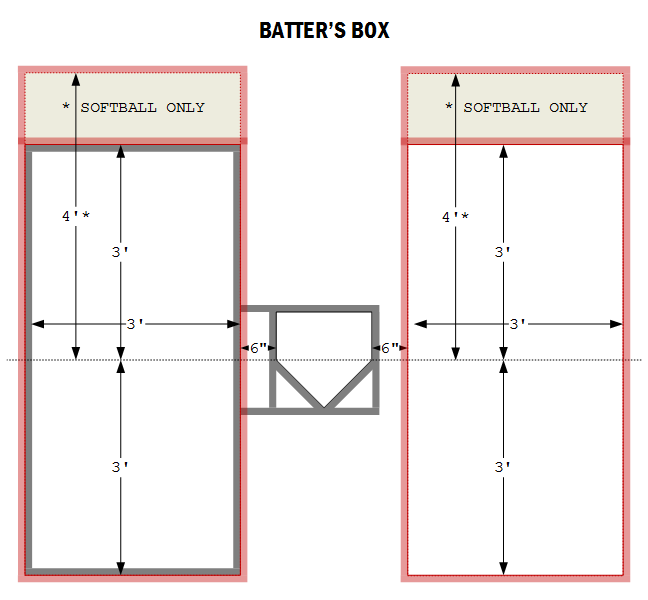 A batters box grid is available near each field. The metal frame grid is shaped or one half of the batters box and contains an outline for home plate to align the grid on the field. A grid is shared by Frost Field and Mark Patrick's Big Hitters Field. 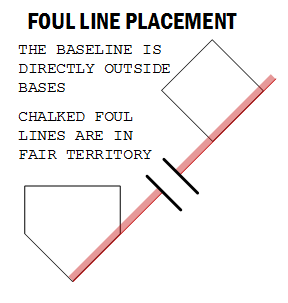 Chalk markers are used to identify the separation between fair and foul territory on the field. Foul lines are in fair territory, but a ball that extends outside of the line is considered foul. The baseline is an imaginary line that extends to the outside of the bases - the chalked foul line runs along the inside of the baseline. 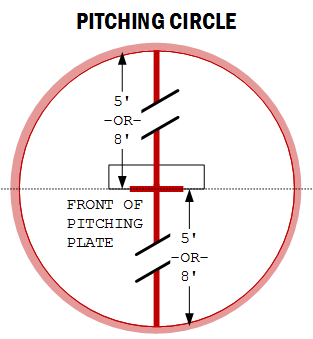 The pitching circle is used in softball and A League baseball as a boundary marker. Softball pitches must be delivered with the pitcher remaining in the pitching circle. Coach pitchers and pitchers helpers must remain in the pitching circle until the pitch is released. The home plate and batters box area of the baseball fields should be covered when the field is not in use. Surface covers reduce the mosture on the ground that created firm surfaces, which eases the field preparation.